I've a 1957 West coast A10 Spitfire that I would describe as a reproduction rather than original, although it does have many of the original parts as confirmed by Magnetoman's excellent detailed thread on this specific model and it did come with a US title dated 1966 with corresponding Spitfire serial numbers. The question is, should the Catalina fuel tank have a vent tube or not? The attached Hap Alzina sales brochure of the day suggest not but MMs illustrations suggest it should have. Also should the colour be red or Silver? Again period black and white illustrations suggest it could be either, dependant on it being west coast or east. 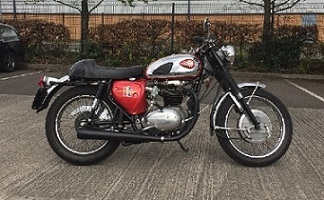 My tank is a indian reproduction in red with a vent pipe and I've a feeling it should be silver without a vent. 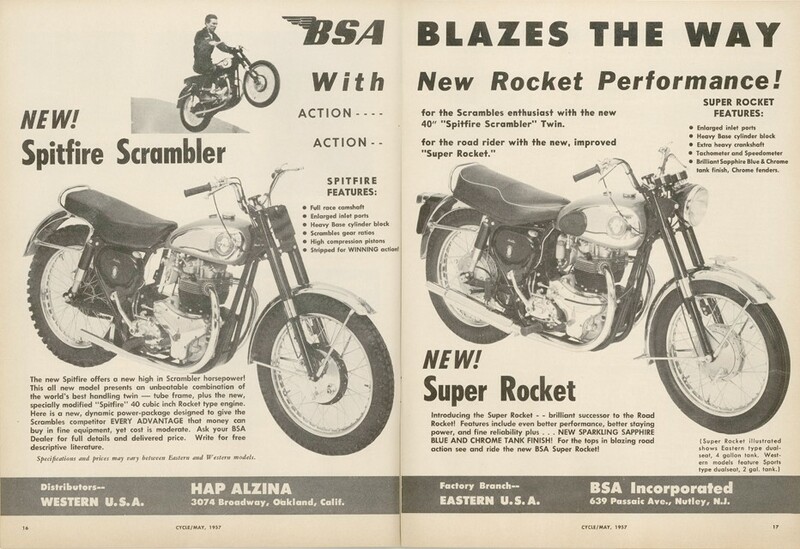 Finally I've just noticed on the Hap Alzina sales brochure that the 1957 Super Rocket came with an 'extra heavy' crankshaft. Does anybody know if this was also fitted to the Spitfire? Last edited by Servodyne; 01/31/19 10:48 pm. Thanks for that. 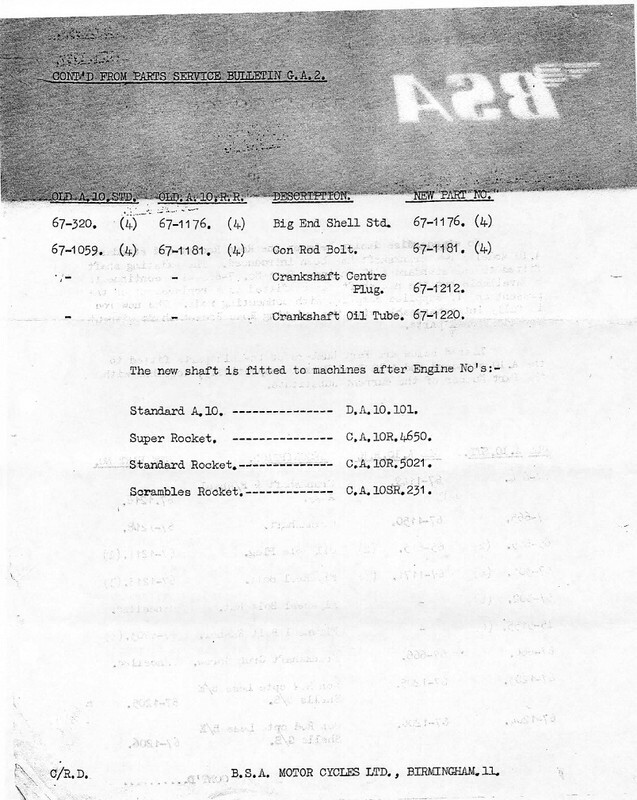 I've just come across the attached service bulletin from a BSAOC member which indicates that they were used on the very first Scrambles Rockets (SR) up to CA10 SR231. I wonder if magnetoman has picked up on this with his. 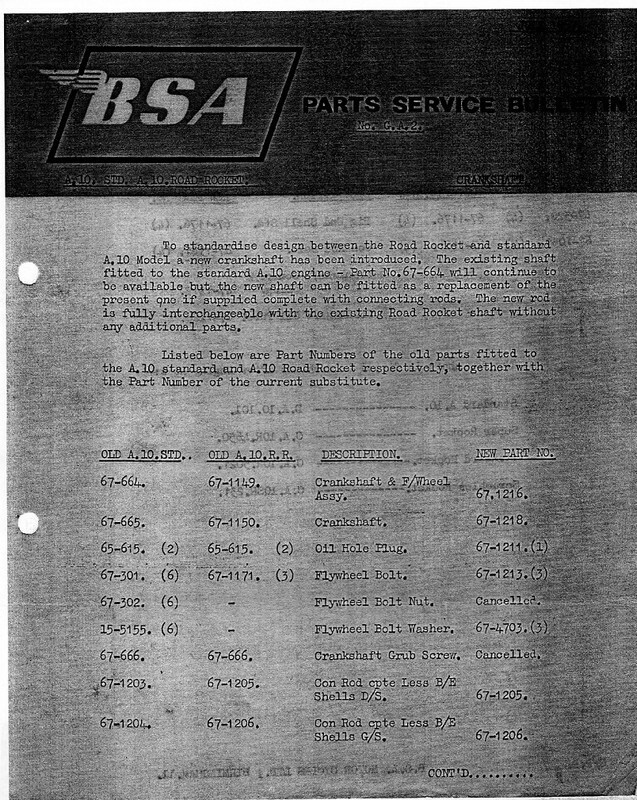 the attached service bulletin ... indicates that they were used on the very first Scrambles Rockets (SR) up to CA10 SR231. I wonder if magnetoman has picked up on this with his. I haven't commented on your questions because I don't know anything about 1957 Spitfires beyond that contained in my restoration thread.. However, thanks for pointing out that Service Bulletin. Although I hadn't posted it because it doesn't apply to my bike -- note: it applies after engine no. 232, not to the very first ones -- I've now added it to an appropriate page of my restoration thread. I must admit that read it that the early Rocket engines had the heavy crankshaft and later ones had the standardised crank with the three retaining bolts on the flywheel. On second reading, and comparing part numbers, I believe you are correct. Which would mean I should find that transitional heavy crankshaft in my Spitfire when I open its cases. Is it not the same crank that was fitted to all the later a10’s? In a word no. Some call them one piece cranks but they're not. They have a flywheel ring shrunk onto the crank forging which is retained by three screwed dowels finished flush with the outer surface. Catalogs MC991-2 (no date) and MC1009-2-2 (reprinted April 1958) both cover 1954-1957 A10s including Road Rockets. Both give 67-1216 as the part number of the Road Rocket assembly, but 67-663 for the standard A10 (for the standard A10 the part no. includes the rods). Catalog 1009-3-3 covers Super Rockets from engine CA10R-6001, which was 1958. It gives 67-1216 as the part number for the A10 and A10 Super Rocket. Since catalogs are updated to include the specifications at the time of printing, short-lived intermediate part numbers that were superseded can be missed. 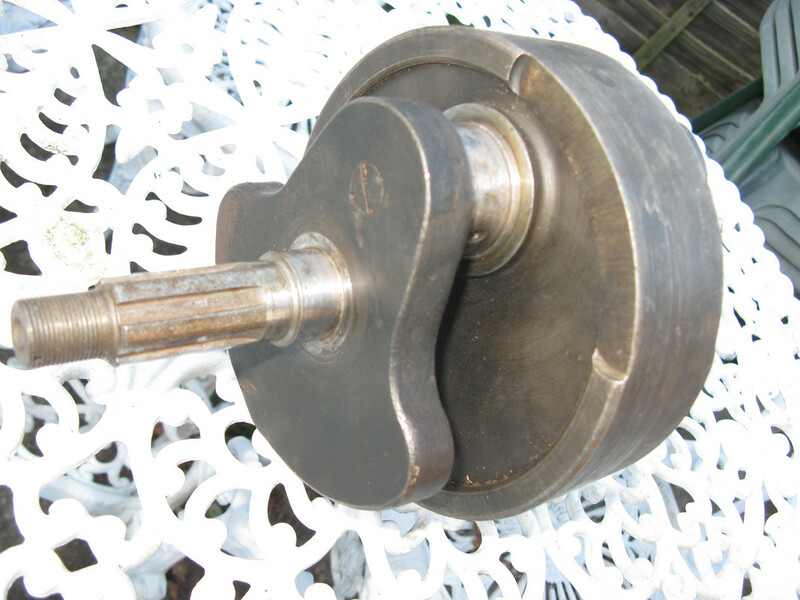 In this case it appears that crankshaft assembly 67-1149 shown in Servodyne's previous post was just such a short-lived item. That's going to be interesting, I'll look forward to reading about it in your excellent Spitfire story. 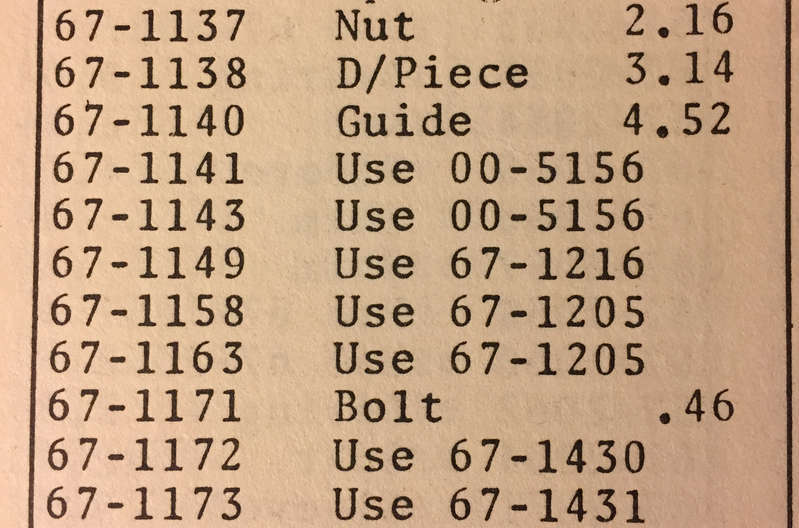 Interestingly, thanks to Servodyne we now know crankshaft 67-1149 was superseded sometime during the 1957 model year[*] but the part number does not show up in the 1959, 1962, or 1963 Master Priced Lists (which include superseded parts). 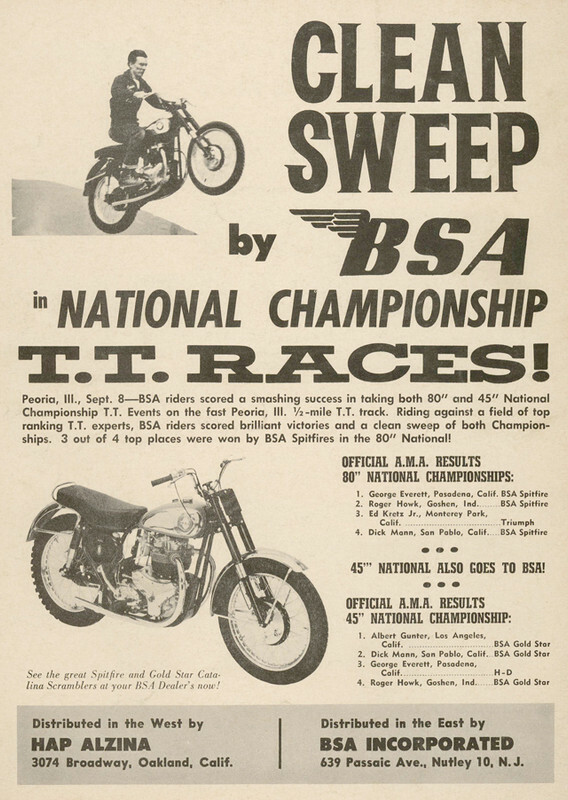 However, it does show up in 1965 (and 1970) with the comment to use 67-1216. [*] Bulletin G.A.2. 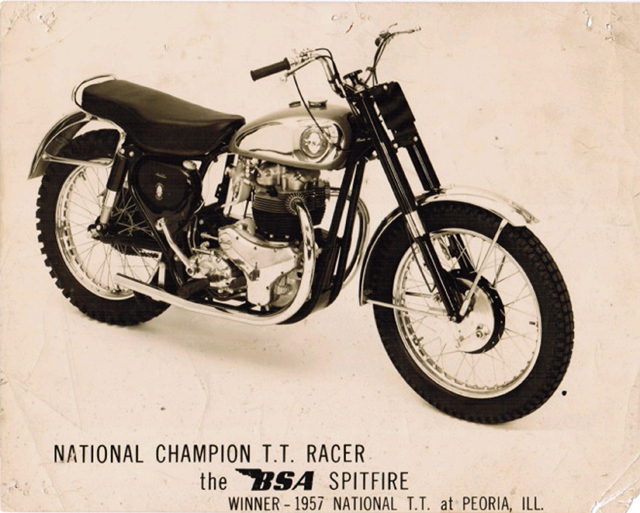 says "Scrambles Rocket" after engine CA10SR.231 were fitted with the new crankshaft, and that bike was despatched 5 May 1957. Cool! Never seen one before, seems a lot of weight in the centre of the flywheel though. Surely closer to the centre any extra weight will not have any gains on inertia... just more weight.